I have really been enjoying the Desitin Multi-Purpose Ointment. I like it for a couple reasons but most of all because the minute I can see her little bum is getting irritated or is about to get irritated I put some on. It’s that “peace of mind” for us mommas. It is petrolatum enriched with vitamins A&D so it creates a protective barrier that starts to sooth the skin. I use this product the most! During every diaper change I will put some on to help prevent any rash from occurring. I have yet to use Desitin maximum strength original paste or Destine rapid relief diaper rash cream but I have some close friends that swear by them! I always have them on hand because I’m that momma who is like a stocked store just incase something might occur I have to be prepared! 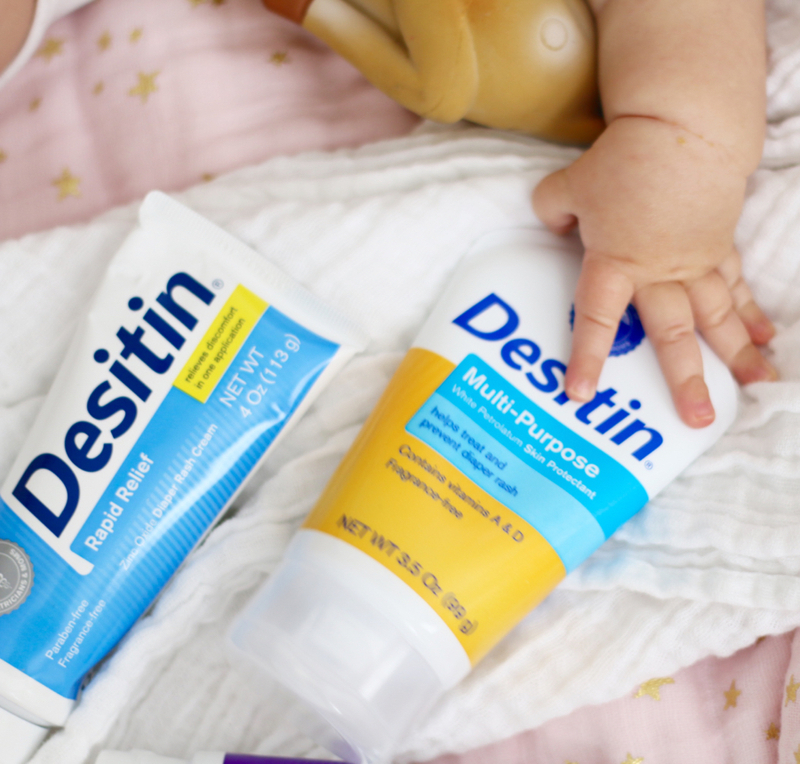 Desitin maximum strength original paste is contains the maximum level of zinc oxide, immediately forming a protective barrier to help heal and soothe diaper rash discomfort. Destine rapid relief diaper rash cream forms a protective layer on your baby’s skin to soothe and relieve diaper rash discomfort, providing relief from the very first use. It is gentle enough to use after each diaper rash. I truly feel lucky that I haven’t had to deal with crazy diaper rash but more so for the babies. I HATE to see them in pain so I strictly follow these couple tips to help prevent it in the first place. Focus on their diet when rashes occur. I will start to add bananas when i notice Monroe has been pooping a lot and if it’s runny. If you have time let your little one be without any diaper for a little bit. Sometimes I will put Monroe on a towel and let her roll around buck naked to air out. It helps! You can do this too after you apply product of choice. Thank you JOHNSON’S® for sponsoring this post. Is the pink metalLic a swaddle or blanket?? My little gIrl is just TEething! So This explains all the runny blowouts!